We have all arrived back to Term 2 with smiles on our faces. However, there have been many changes with lots of missing teeth or teeth hanging by a thread! Have a look at our beautiful gappy smiles. Hi room 13, I love your 'gappy' smiles, you all look so cute!!! Hello Room 13 Friends. Oooohhhh noooo!!!!! Keep brushing your teeth after you have those special treats otherwise you will all be talking like Grandmas and Grandpas soon!! Maybe it is because you are all growing up and already looking like big year 2s and 3s. Hope you had a great holiday and are ready for new learning. 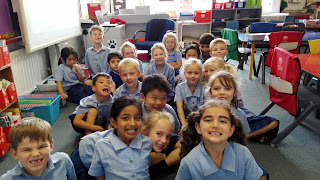 Have a great term : ) Miss S and Room 12.
you're an awesome class of smiling faces room 13! !